Payment protection - it is possible to buy a payment protection insurance for that company to cover any financial riscs of prepaid amounts! Fotos and Videos of the boats are samples. Some fotos of the specific boat are available on request. Equipments are subject to the equipment list and can vary. Specificly very demanded equipments must be asked individually and reconfirmed by the chartercompany. 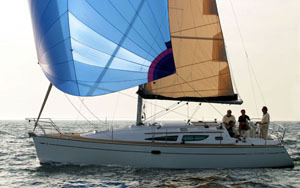 The chartercompany reserves the right of variations in equipments of alternative yachts e.g. in case of unexpected situations. further extras for use credit cards (eg to pay security deposit ) or debit cards in Turkey one needs to know the PIN. It is normal practise everywhere in Turkey to use the PIN system. Exception are VERY small, well behaved dogs, extra charge dependig on deepclean needs decided at return by the basemanager. This is a not binding offer. All data, equipments, prices and conditions are subject to be changed at any time without notice. Only the confirmed booking-contract of the chartercompany is valid. All mistakes reserved. If you want to make sure, your demanded boat is equipped with a specific equipment, please ask confirmation by email. .